will be returned to the original requester. Rather than finding it odd to receive a pasted chunk of a manpage via IM, I was fascinated by the content. By configuring dnsmasq to be a slightly obnoxious netizen, you can effectively always have your queries answered by the fastest server — whatever it happens to be for that query. What I wondered was how big of a difference it would actually make. Would there be a measurable difference? 5%? 20%? I decided to take namebench for a spin and find out. 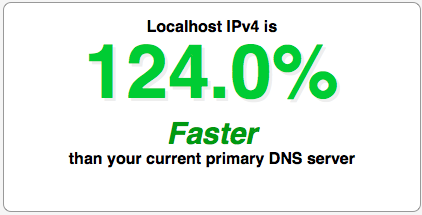 In fairness, namebench found a couple of servers that are slightly faster than my ISP’s, and dnsmasq wasn’t 124% faster than them. But it’s still a huge improvement. The fastest is another of my ISP’s servers, with an average of 53.65ms. 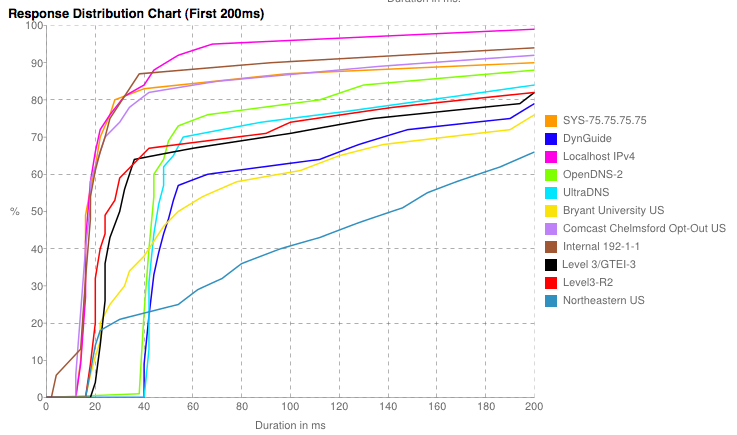 Level 3’s 4.2.2.1 open resolver averaged 60.48ms, OpenDNS averaged 69.21ms, and Google’s 8.8.8.8 averaged 75.82ms. 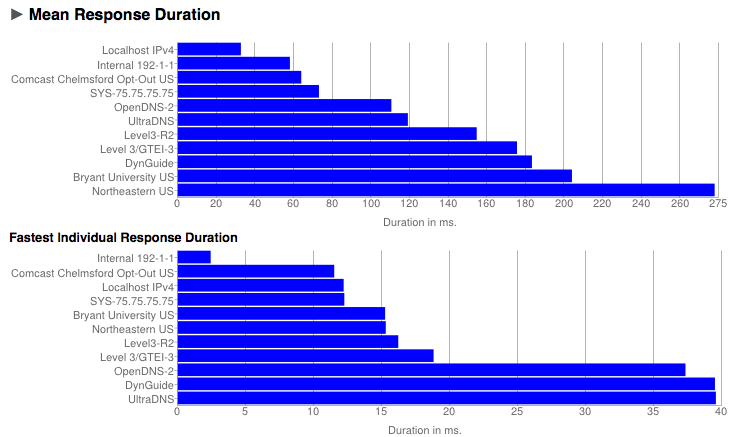 What’s interesting to me here is that, by asking multiple servers and always returning the fastest, dnsmasq with –all-servers ends up being considerably faster on average than any single server. It averaged 32.00ms, while the next best one averaged 53.65ms. And bear in mind that this is with dnsmasq’s cache disabled because I worried that it would bias results in favor of dnsmasq. Recall, too, that this is with caching disabled in dnsmasq! It had one hand tied behind its back and it still won by an incredible amount. Take note that you should not use the “cache-size=0” or “no-negcache” entries — they hurt performance. (And very badly in the real world!) I included them only to rule out the possibility of dnsmasq being faster because it was working from local cache. Of course, you really shouldn’t blindly copy-and-paste this, and it’s a very vanilla setup. I ran dnsmasq in the foreground with sudo dnsmasq -d --all-servers. What I’m wrestling with is the question of whether this is such poor “netizenship” that it’s bad practice. With --all-servers set, dnsmasq will send a copy of your query to every nameserver in /etc/resolv.conf. That’s five entries for me, effectively increasing load on DNS servers five times. That’s pretty obnoxious. (Though having five entries in /etc/resolv.conf is unusually many.) But at the same time, perhaps the biggest advantage of dnsmasq isn’t its borderline-magical --all-servers flag, but that it’s a caching resolver, which helps reduce the number of DNS queries that make it out of your network. So perhaps the impact isn’t quite as bad as it might seem. And in an ideal world, you’d only hit the your ISP’s servers, or a free service like Google’s or OpenDNS’s public servers, which would answer out of cache. So it does feel a little selfish and like a tragedy of the commons, but I don’t think it’s actually overly harmful. 1 Or something like that. I don’t actually have a transcript of the conversation. This entry was posted in Performance by Matt. Bookmark the permalink. I would still consider it bad netizenship because it trashes the individual caches if more people start doing it. The normal way is, libc chooses the first (first to answer, not sure) from /etc/resolv.conf, and sticks with it. 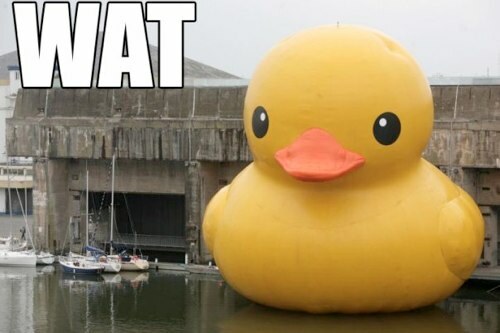 So this resolver does the caching for this client from that point on. In most networks, the cache of the name server is populated with entries common for the users of that network. It could be used for DNS-Amplification-Attacks, if the dnsmasq server is reachable for the bad guy. Even worse, if more then one dnsmasq server is chained. So my suggestion is: If your provider is offering more than two name servers, test them, and choose the one fastest for non cached queries (there). B/c it seems to be fast, and you get the RAM and cache for free (without paying energy). If you notice one of the servers holds all the cache of your queries, then you’re fitting in with your usage, choose that, it is even faster for you (as you might use the same gTLD, ccTLD as the other users. What I had actually intended, but didn’t really make clear in my post, is that this is something you’d run as a DNS server for a small LAN. I just used localhost because I didn’t have a spare box to set this up on at the time. It would be wasteful, as you say, to run this on each box on a network, and dangerous to run it on a public server. But for a small LAN, I think it’s ideal — it will develop a local cache, and cache misses will get answered quickly and then cached. It seems (based on my observations, but not any great experience with the code) like the way libc works is that it always uses the resolvers in order. If the first entry in resolv.conf is invalid, name resolution will be delayed several seconds. This is exactly as most libc implementations work today, which is stupid, because there are a few other implementations, that take answer time into account (some MTAs have that, for it’s own resolution). Can You update this tutorial on how one can use the “–all-servers” flag inside the /etc/dnsmasq.conf file ?